'Tis the season where even the most lightly domesticated among us begin to think seriously about hostessing. 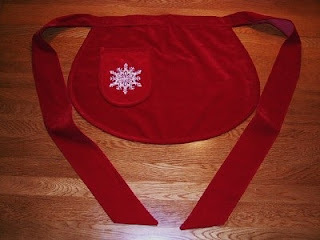 And there is no better helper to moving into that mindset than an adorable party apron. I resisted aprons for years. But given my love for delicate fabrics and cooking with hot oil, and an innate inability to do things slowly and with great care--the point doesn't need to be belabored. Sautéed silk is not a good look. Once the mind is opened to aprons, the possibilities are as wide-ranging as fashion itself. Cute little gingham numbers for baking pies. Starched bibbed whites for channeling Julia Child. 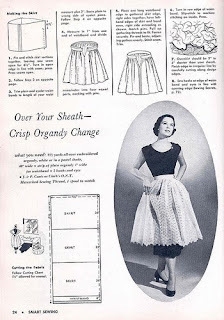 And my favorite of all, the frilly, frivolous, transluscent organdy and organza half-aprons--like those Betty Draper wore when she was still serving Don dinner on Mad Men. These latter truly are fit for company--showing off a lovely dress underneath while denoting one's status as Goddess of Hearth and Home. If you can sew your own, pattern sources like the encyclopedic So Vintage Patterns offer some wonderful options, complete with illustrations showing how to most effectively wear your apron (think Dovima modeling the latest Dior). 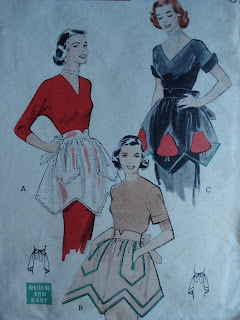 Or, have a look at dedicated apron blogs like Apronista . . .
Or take a cruise around online sources. Ebay currently offers this charmer, among many others. Aprons. If you're going to throw a party, go ahead and tie one on. Nice apron I want this for my cooking lesson.